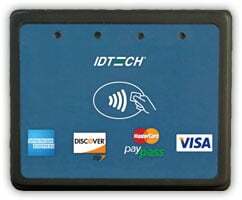 The IDTech Xpress CM100 reads card data from a variety of contactless sources, including credit cards, key fobs, and NFC-enabled cell phones. It is perfect for a wide variety of applications, including quick service restaurants, ticket booths, parking garages, retail locations, public transportation, and gas stations. With support for Visa payWave, MasterCard PayPass, American Express ExpressPay, Discover Zip, and MIFARE & NFC technologies, the Xpress CM100 can be integrated into just about any application that accepts contactless technology. The ID Tech IDCA-1261 is also known as IDTech	IDT-IDCA-1261	or IDCA1261	.